TraderDirect is a simple and effective tool that allows you to improve how you communicate with your customers. Using TraderDirect leads directly to incremental sales and incremental margins while keeping the salesperson in control of the sales process. TraderDirect allows you to get in front of every possible prospect within minutes and provides immediate feedback. For the busy salesperson, this means you know who to call and when to call. Click here to find out how TraderDirect strengthens the sales process. You'll get the flexibility to either create custom price lists per individual customer, or blast them out to several hundred all at once. Add product photos or links to your website. 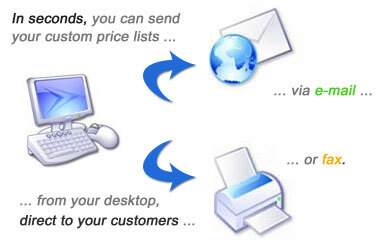 Get your price lists out FAST to customers and prospects. Know when they're looking, know when to call. Ideal for lumber, seafood, produce, or any other commodity product. Excellent for locating trucks and dispatching loads. In competitive markets, salespeople that use technology have an advantage - become a TraderDirect user, give yourself the advantage. Click here to request a customized demo. Want to book loads faster and easier? Schedule a Demo. We'll customize TraderDirect for your company and give you a demo at your convenience. The Wave Online recently wrote an article about the benefits of using TraderDirect. Click here to read the article. "TraderDirect is an excellent way for me to get my prices out to all my customers quickly and consistently, without affecting the way I do my job."